Applied Kinesiology (AK) literally means “the study of muscles.” The body runs on circuits, known in Chinese Medicine as meridians, much like your house does. What happens if you have too many plugs in one wall socket? A short circuit. The same thing happens in the body. If there is too much or too little stimulus on a pathway, or meridian, whatever is on that pathway suffers. Kinesiology is a way to use your body like a computer and your muscles like a keyboard to access information. Your body is about 75% water, and water conducts electricity (thats why we are not supposed to bathe with a toaster). A Kinesiologist uses this premise to find the short circuit in a patients body and then proceeds to back track and find out WHY the problem occurred. Applied kinesiology is a form of diagnosis using muscle testing as a primary feedback mechanism to examine how a persons body is functioning. When properly applied, the outcome of an AK diagnosis will determine the best form of therapy for the patient. Since AK draws together the core elements of many complementary therapies, it provides an interdisciplinary approach to health care. In general, the Applied Kinesiologist finds a muscle that tests weak and then attempts to determine why that muscle is not functioning properly. The practitioner will then evaluate and apply the therapy that will best eliminate the muscle weakness and help the patient. Therapies utilized can include specific joint manipulation or mobilization, various myofascial therapies, cranial techniques, meridian therapy, clinical nutrition, dietary management and various reflex procedures. In some cases, the examiner may test for environmental or food sensitivities by using a previously strong muscle to find what weakens it. Applied Kinesiology is used in addition to standard diagnostics to help determine the cause of a health problem. For example, with certain conditions like hypoglycemia, there will be muscle patterns of weakness or strength found with AK. However, these same patterns could be present because of another nervous system problem such as disease or some type of adaptation. Only an adequate history of the person, together with standard examination procedures and laboratory findings, will indicate the proper treatment course. Therefore, people performing a simple muscle test and diagnosing what vitamins are needed or other information about health without standard examination is inappropriate. This is making health decisions well beyond what a simple muscle test can determine and actually may be harmful. The determination of your need for dietary supplements requires knowledge of your symptoms along with an examination for known physical signs of imbalances and a dietary history. Blood, urine, saliva or stool analyses may be added to the foregoing. An AK examination provides additional information and can help to determine what is missing and needs supplementation. Using AK, a doctor can often determine which of the many available laboratory tests are the most appropriate to be performed. This can result in a more effective diagnosis while at the same time reducing health care costs. This is the chiropractic premise. If something is blocking the flow of nervous energy to or from a muscle, organ or gland, it will slowly disease and die. Chiropractors gently and specifically move the bones off the nerves to free this flow. Whenever we use our bodies, we produce toxins. An extreme example is when we exercise, we become sore. This is due to a build up of a toxic substance known as lactic acid. Our bodies, mainly our liver is part of a system known as the lymphatic system. The job of the lymphatic system is to find and rid our bodies of these toxic substances. Each and every muscle, organ and gland has its own neurolymphatic drainage point. If this point gets overwhelmed, it shuts off and stops cleaning that muscle, organ, or gland to which it is attached. Eventually, that muscle, organ, or gland gets backed up with toxins and stops working properly. A kinesiologist can find these deficiencies and correct them almost immediately. Everything in our bodies works because it has blood flowing to it. No blood, no life. Your muscles, organs, and glands are no different. Certain activities or injuries diminish the flow of blood to our bodies through a route known as neurovascular reflexes. These are reflexes that are found mainly on the head and face, that when stimulated, improve the flow of blood and oxygen to its intended site. There are structures in your brain that produce a fluid known as Cerebrospinal Fluid (CSF). This fluid bathes and protects the brain and spinal cord. Most people used to believe that the bones of the skull did not move. Through recent studies, it was found that in fact, the bones of the skull move in a predictable rhythmic motion at approximately 8-15 cycles per minute. This gently pumping action of the skull bones pumps the CSF throughout the spinal cord cavity. If the bones of the skull get pushed or stuck, this pumping action is disturbed and the rhythmic flow changes. Things such as falls, car accidents, and probably most importantly- childbirth affect the motion of these bones. Many diseases and deaths have been scientifically implicated in certain methods of the birthing process. A slow and deliberate delivery can help ensure the minimum of birth trauma and a healthy baby. Most cases of Sudden Infant Death Syndrome (SIDS) have been linked to ” massive subluxation in the cervical spine” which means that the head and shoulders were pulled out so forcefully that it tore the spinal cord. Approximately 60-90 pounds of force are applied to the infants head during delivery which is enough to stretch the neck to almost twice its normal length. It is absolutely critical to have your newborn checked for subluxations of the neck and skull as soon as possible. Remember; as the roots are bent, so grows the tree. As we mentioned briefly before, and will discuss in more depth in the following section, the body runs on circuits known as meridians. These meridians carry energy known as Qi (pronounced chee). This Qi carries the vital life force necessary to maintain not only health but life. If there is any interruption of the flow of Qi, dysfunction and disease begins. A Kinesiological evaluation will help determine whether your problems are coming from structural changes, biochemical deficiencies or excesses, or any possible neuro-emotional influences. Every muscle, organ, and gland in your body requires certain nutrients in order to function at maximum capacity. This is why we are supposed to eat a balanced diet. Most of the foods today are completely depleted of any vitamin and mineral content. 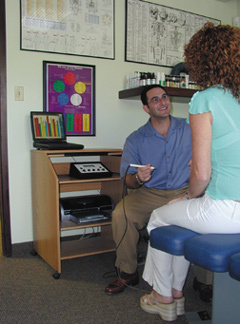 Dr. Leff performs a Kinesiological evaluation to determine what your deficiencies are and what can be done to fix them.